Dr. Eggman piloting the Egg Walker. This page is about the Sonic Adventure 2 vehicle. For the Sonic Adventure boss, see Egg Walker. For the '06 badnik, see Egg Walker (Sonic '06). 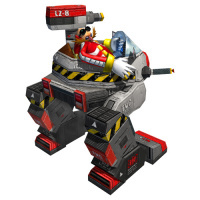 In Sonic Adventure 2, the Egg Walker is Dr. Eggman's combat mech. It is based on the design of the doctor's classic Eggmobile. The walker features a guided laser blaster (like that of E-102 γ in Sonic Adventure) and a single shot "Volkan Cannon" for destroying wooden crates. The center of the chassis also conceals a spring-loaded boxing glove for close combat. Upgrades available in the game include the Jet Engine, a leg attachment for hovering, and the Large Cannon, a Volkan Cannon enhancement to allow it to destroy metal crates. In the 2-player mode, additional weaponry is gained when a multiple of 20 rings is obtained, such as a multi-shot laser, a heat-seeking rocket launcher, and a gigantic laser cannon. The latter two can been in Story Mode when playing as Tails, when fighting against Dr. Eggman for the second time. In Sonic Adventure 2: Battle, it is possible to get a secondary "costume" for the walker with camouflage; however, this is only available in multiplayer versus mode. This page was last edited on 28 January 2015, at 21:56.